Philadelphia may be the place most known for its signature cheesesteak, but Chicago has several options that could make this city your ideal choice for a breaded steak sandwich whenever you're in town. Here are the top five places to stop at if you want an unbeatable breaded steak sandwich to leave you satisfied. USA Today writer Ted Berg officially called Ricobene's breaded steak sandwich the best in the world for a reason. 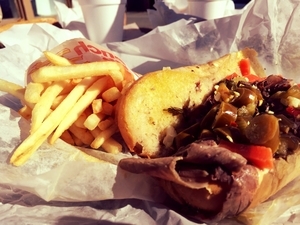 Best ordered with mozzarella and the Chicago staple giardiniera, the meal features a combination of all of the flavors and textures you want in a steak sandwich, with tasty crispy breading, tender beef, and perfect seasoning. Located in Chicago's South Side near Chinatown, Ricobene's has built a storied history in the city since 1946. Over the years, they've developed a solid reputation as one of the best eateries in the city. Husband and wife James Gottwald and Jennifer Monti wanted to bring Philly to Chicago, and subsequently developed Monti's (Jennifer won the coin toss), a place where you can get one of the best cheesesteak sandwiches in town. Best ordered with the authentic American white melted cheese, many locals can attest that their Philly-style sandwiches are among the best on the North Side near Lincoln Square. If you're looking for something with more of a Latin flavor combined with an air of American familiarity, El Cubanito is another Chicago favorite. Located on Polaski in Logan Square, this counter-service joint serves up traditional Cuban sandwiches along with steak sandwiches, both of which are best served with empanadas. Keep in mind that one sandwich is enough for two if your appetite isn't enormous. While not a long-running business as of yet, they're quickly gaining popularity as one of the hottest sandwich joints in the city. Established in 1990, Philly's Best has become a great transplant for the taste of Philadelphia, with multiple locations throughout Chicago to make it a relatively easy place to visit and try. Their Classic cheesesteak sandwich is served in the traditional Philly style with melted cheese, thinly sliced steak, and the perfect proportion of grilled peppers and onions, but you may want to try it in combination with seasoned cheese fries, which also receive great reviews. There are plenty of family-run food stands to be found in Chicago, but Mr D's Shish-Kabobs stands out for its daring attempt at steak sandwiches and grilled shish kabobs. Located on Diversey on the North Side, Mr D's has become a classic stand thanks to its signature steak sandwich, which features thinly sliced beef tossed on the grill for no more than a few minutes on each side, leaving it caramelized and juicy at the same time. It's then basted in gravy and decorated with onion to maintain a balance of texture and flavor. With these delicious options available, it's no wonder Chicago has become every bit as popular for breaded steak sandwiches as its Eastern rival Philly. Whether you're a resident or just in town, you'll do well to check these hot spots out for some of the best-tasting steak sandwiches in the nation.